My first post. I've been reading all your posts about your builds, and had done some research of my own. I'm woking on a 4x4 build for Colorado's high country. I live at 9017 feet. Planning on the Airtronic furnace for heat. And I found this nice little 12v hot water heater I plan to use for the outside shower (mostly summer use). I'm always interested in everyone's thoughts, so let me know what you all think. Its gonna be a RB, Penthouse 150s 4x4. Whale Heat 12v 3 gallon Hot water heater. How will you be using your shower? If for showers after driving then you can wire the 12v water heater to heat only while the engine was running and have minimal impact on battery life. But if you prefer to camp and have hot showers after returning from a day of hiking, mtn biking, etc. you might be better served by the Webasto Dual-Top combo furnace / water heater in place of the Airtronic. Or if you want to stay simple use something like the Zodi Extreme for off-grid showers. That's similar to what we do with our Sportsmobile Sprinter with 120v water heater and inverter - use the electric water heater when driving, but use the Zodi Extreme when camped off-grid. I recommend at least 2 batteries, deep cycle or AGM or similar, and solar when/if you can add it. 12v stuff eats a lot of battery, not to mention your lights and other 12v needs when camping. Most people with SMBs and other camper vans have all the battery bank they can fit. I could only find it at around $400, which doesn't make it much different than propane water heaters pricewise. Are you trying to go without propane? Welcome Dragonfly, The shortest answer to your proposed design is, Yes. Beyond that there is probably a lot that can be discussed. 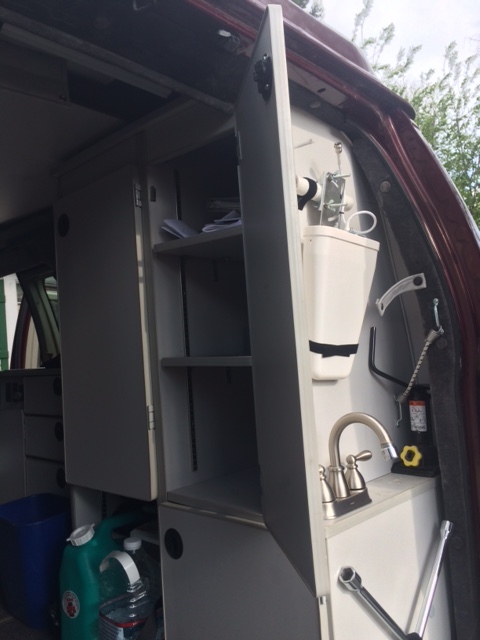 Your post caught my attention because my van happens to be a RB, PH top, 4x4, no propane, with an esbar diesel heater that I had installed a 12v hot water heater and aft door shower. However I live in the Springs which is only 6100 ft. Oh and it's not a sprinter. But! So, my van originally came with the flat plate that SMB used in 2005 which when I bought the van used in 2010 had ruptured and mixed the coolant and the domestic water. Long story for another day. So I haven't had hot water for several years but wished I did. I was inspired by a post by forum member that had modified a point of use 2.5 gallon water heater with a 12v element. Sorry I can't seem to find that post. So here is an over view of the system. Home depot 2.5 gallon water heater installed in back cabinet. Cold feed line comes from under the sink just to the left. I removed the original 1500 watt element and replaced it with a 300 watt I purchased from here 6 Inch DC Submersible Water Heater Element. Hot water goes to the sink and the shower faucet on the other side of the cabinet. I wanted to have the shower pipe short as to have the hot water nearly instant. Yes, I need to run a copper pipe from the T/P valve out under the van. It's on the to so list. 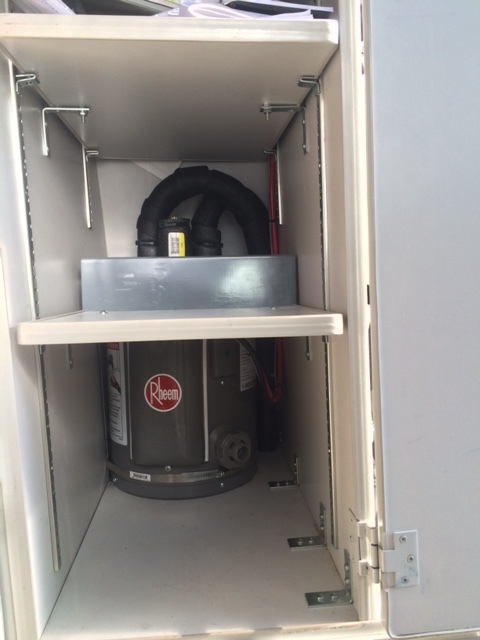 Here is a view of where the water heater is located (same open cabinet as previous picture) and where the rear faucet is located. This is shower mode. If privacy is wanted I just clip a tarp/curtain across the back doors. I have one of those portable aluminum RV steps so one isn't standing in the dirt. Here are a couple of thoughts though. I have only one 4D 200AH house battery with 280 watts of solar so, not a lot. I do have a 200 amp alternator with dual rectifiers so I do run the water heater any time I'm driving. If the water heater is cold say 60 degrees it dose take 1.25 hours to get to 126F ish. I usually see on the batt monitor that to go from cold to hot will burn 30 ish Amp hours if I try to do it all off of the battery (which I hardly ever do). If I have lots of power available, say solar is topped out and its 1PM on a sunny day, I will "dump load" into the water heater. 2.5 gallons of 126F water isn't a lot so no Hollywood showers however Mrs. ShuttlePilot and I have taken consecutive showers conserving. Traditional RV folks love to see my van and then flip out when I tell them I only have 2.5G of hot water. Finally, the water heater in the cabinet will keep the water hot for a pretty long time. I have run it at noon and still had fairly hot water in the evening. 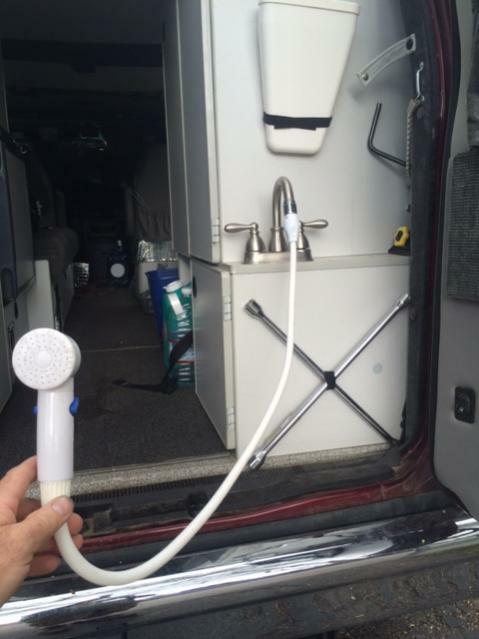 I recently spent 3 weeks living out of the van and used this shower setup most of the time. I wouldn't say this is the best system for everyone but it's worked way better than I originally thought it would and no more drinking antifreeze. Oh and I think I only paid 200$ for the water heater, 30$ for the element but I splurged on large cable to wire it, don't remember what I paid for that but voltage loss is your 12 volt enemy. Plus some pex and fittings. So Yes it is possible. If I can be of assistance please ask. Thanks Boywonder. I apologize for not crediting your work by including a link in my post. Thanks for all the input. I really like that WEbasto Dual Top. Its an elegant solution to my needs. Wonder if SMB would install that on my build. Its not offered on their options sheets. They seem to like Espar. I don't think we are going to use a ton of warm water, and we won't likely be parked for too long. Mostly going to use this for weekend get aways. I'll be using the standard SMB install for the electric system which I think is 200Amp battery plus the inverter/charger. I also ordered the van with the second alternator mount and the high idle control as my "generator". Last spring we had some plumbing work done on our house, and we used our Nemo camp shower filled with warm water from the stove. My wife and I could both shower off of one fill. 11L/3Gallons is plenty, so I do really like the idea of that Webasto.